Lesson Learned: There is a difference. I have been struggling with my search results for this Mastering Genealogical Proof study. My genealogical question is, Did James A Wake serve in the Civil War? How can you prove that he did not serve, when you can’t find a positive piece of information that states that. During the peer review of the Source Analysis I had done, I said that my search on Fold3.com was Negative, as I didn’t find anything. The review by the Evidence Explained team challenged me on this. In fact, the recommendation was that it is INDIRECT evidence. Looking at what that meant, was simply “keep looking”. That indirect term is a warning that you haven’t answered the question yet. All that to say that what I really had was “Negative FINDINGS“. I have adjusted my search results for Fold3.com to Indirect. Haven’t found the answer. From the information collected so far, I will only be able to infer that he did not serve and will not be able to prove it. The inference will come from the understanding of the Classification in the Congressional Registration and not being able to find any reference to his serving in any other source that is available. If you have been following my Blog on the book, Mastering Genealogical Proof, you may has seen that I put a Source Analysis Report out for Peer Review. Never in my wildest dreams did I expect to receive comments from Elizabeth Shown Mills. I have had the pleasure of meeting her a couple of times, in person, but did not expect to have a review of my struggle with this book. When I went back at the chapter AND how I was using Evidentia I missed something that was right in front of me, but didn’t see it. The book, and Evidentia are walking me through the steps, I wasn’t DOING the steps in order. The report I was running, and putting out for peer review was a Source Analysis Report. But what I was missing, I was creating that report with the eye of one who has already done detailed analysis on the data collected. 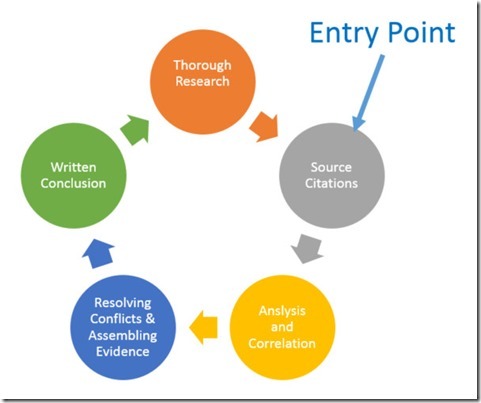 I had already been through the cycle and was returning to document the analysis. Like reading the last chapter of a book, then judging the book by its cover. Let me try a different way of explaining this. I see a Container of something, then describing the container after I already opened the package that was inside of the container. If I consider a SOURCE as being a Container, for this report, I should be trying to describe the CONTAINER. Is it Round, is it Square, Did it come by truck, by plane or by boat. I should be trying to describe that its round or not. If its not round, it could get to me by truck or boat. For the topic at hand, is the SOURCE an Authored Work, or is it a Record, and that Record could be original or it could be derived from records. The container being Round or Source an Authored Work, it might contain someone interpretation of records, but it will never be a record. The Square container or Record, might come in two forms, an original record or derived, but these two records will never be Round. 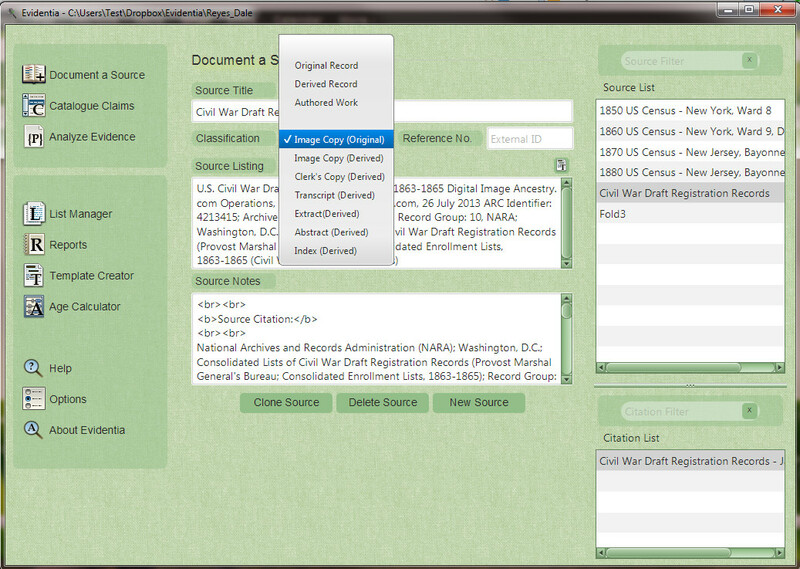 We start with this screen, then we select Document Source. I have created a Source using the Template Feature, that walks me through the fields that need to be in a Source Statement that will become a Citation later. I must Classify what this Source is. The options are Original Record, Derived Record, or Authored Work. Is the CONTAINER Round, or Square, and if square did it come by boat or truck. Evidentia helps us with that on this screen in that. It asks if we are looking at an Image Copy, then it would be Original, or is it an Image copy that is derived. Derived from something else. Is it a Clerk’s Copy, a Transcript, and Extract, Abstract or an Index, all of which would be derived. The next step is to Catalogue the INFORMATION in the Container. Not analyzing the information, but cataloging the information. We start, in Evidentia, by identifying the Claims from the information that we are presented with. Is it Primary, Secondary, or we can’t determine (Indeterminable). For a US Census Record, until the 1940 Census, we could NOT tell who the Informant of the information was. All US Census until 1940 would be “Indeterminable”. We just don’t know, nor can we guess. Can we determine from each claim who gave the information. That’s simple, or is it? Information collected from that container, could be a mixture of Primary or Secondary. Did the Informant give the information directly, from experience, or from someone else or was told about the information being asked. In the case of my Civil War Registration record, all of the information that was recorded in that book have been concurred in by other records. So, if James A Wake gave the information to the clerk for recording into that register, the informant and Classification would be Primary. So far, I have classified the Source as Derived, and the Information as Primary, trying not to confuse the content with the container. My peer review document had confused, but my data entry, the content then the container or source. I didn’t see any signature, nor statement of who the informant was, so I had selected indeterminable. But the information provided would have been answered by someone who knew or witnessed making it Primary information. The third step, sticking with this first Container or Source is to evaluate the Information Collected or Evidence from This Source. Evidentia helps with that as well. We have to choices when evaluating the Claims. Direct or Indirect or Negative. The claim makes a clear statement or we have to pull information together or to be able to answer the question. Lesson Learned: Answer the questions, in Evidentia, in the order asked. Don’t read the last chapter of the book to find out how the story ends, before reading the book. Lesson Learned: This experience does NOT mean that the information is correct or incorrect. I won’t find that out until I have followed these steps, in order, several times, before I can analyze ALL of the information that I have collected. That’s the next step AFTER I have found more sources. As posted yesterday (previous blog post) there was a very lively, VERY informative discussion on this report on Facebook: The dialog include my Cousin DearMYRTLE, developer Ed Thompson, Evidencia User Jenny Lanctot and Elizabeth Shown Mills. What an honor and privilege it was to see her name at the beginning of the discussion and her contribution to this discussion. At Elizabeth Shown Mills suggestion, I submitted it to the EvidenceExplained Forum for review. It was reviewed with some very helpful recommendations. I have made the changes, based on ALL of the learning from this experience, and have included them in this updated report. The source reviewed was a clear unaltered Image Copy of an original record. Consolidated Enrollment Lists, 1863-1865 (Civil War Union Draft Records); ARC Identifier: 4213514; Archive Volume Number: 3 of 6. Ancestry.com. 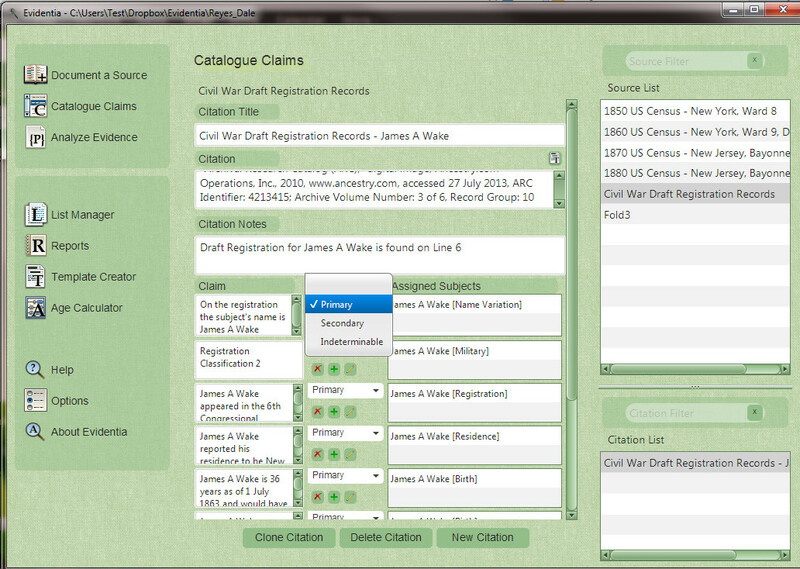 U.S., Civil War Draft Registrations Records, 1863-1865 [database on-line]. Provo, UT, USA: Ancestry.com Operations, Inc., 2010. 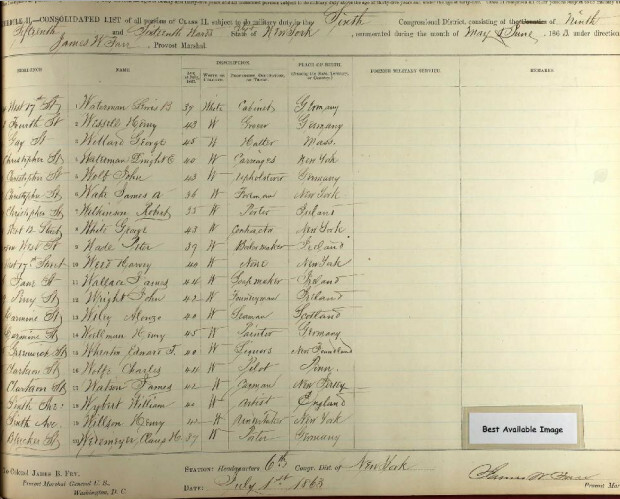 Consolidated Lists of Civil War Draft Registrations, 1863-1865. NM-65, entry 172, 620 volumes. ARC ID: 4213514. Records of the Provost Marshal General’s Bureau (Civil War), Record Group 110. National Archives, Washington D.C. Claim: This reference asserts that On the registration the subject’s name is James A Wake. The information is believed to be Primary (meaning the person providing the information was a knowledgeable eyewitness or participant in the event). Claim: This reference asserts that Registration Classification 2. The information is believed to be Primary. Claim: This reference asserts that James A Wake appeared in the 6th Congressional District Registration record in New York. The information is believed to be Primary. The evidence supporting the claim is considered Direct when applied to the question of the Registration of James A Wake. 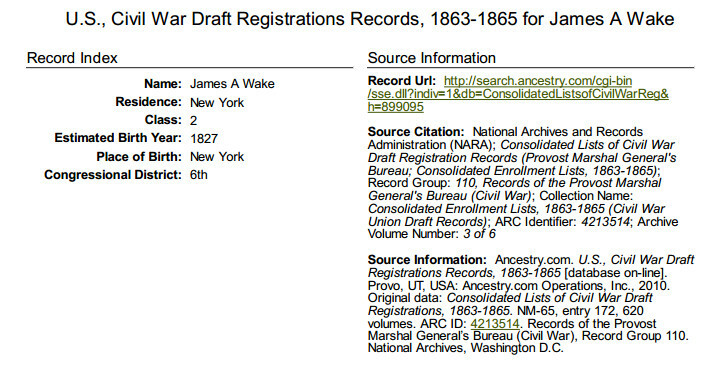 The Civil War Registration reports that James A Wake registered for the Civil War Registration in the 6th Congressional District in New York.From Ancestry.com: This is a collection of lists of Civil War Draft Registrations. There were four drafts between 1863 and 1865, which included 3.175 million records. Historically, the 1863 draft was one of the most tenuous moments in the Union outside of the battles fought on Northern soil. Most of the concern was due to the draft riots that took place in New York in 1863. These records include 631 volumes of registries and are basically lists of individuals who registered for the draft. The records are split into two different classes, Class I are those aged 20-35 as well as those 36-45 and unmarried. Class II is everyone else that registered. Claim: This reference asserts that James A Wake reported his residence to be New York on Christopher Street. The information is believed to be Primary. Claim: This reference asserts that James A Wake is 36 years as of 1 July 1863 and would have been born about 1827. The information is believed to be Primary. Claim: This reference asserts that James A Wake reported Place of Birth to be New York. The information is believed to be Primary. Claim: This reference asserts that James A Wake reported marriage status to be Married. The information is believed to be Primary. Claim: This reference asserts that James A Wake reported his occupation to be a Foreman at the time of registration in 1863. The information is believed to be Primary. Claim: This reference asserts that James A Wake reported No military service James A Wake reported No military service. The information is believed to be Primary. Changed Indirect Evidence to Direct. This is based on the presumption that James A Wake provided the information directly to the Clerk for the records. I was reminded that the information recorded does not have to be true. In looking at the document, the registration logbook page in the image, may not have been recorded at the exact time that the information was given to the clerk. The records were in alphabetical order, with the same handwriting. The Informational Classification was changed from Indeterminable to Primary as the information was provided by a knowledgeable person. I have been dealing with the fact that I am not able to find him in any Civil War records. I have had my searching on Fold3 as Negative Evidence. That is now Negative FINDING. I currently have no way to record that in Evidentia, but will have to remember to change the wording in any Proof Statement that it’s negative findings. Bottom line, for me at this moment, that I will NOT be able to Answer that Question. Following the Dear MYRTLE Google+ Hangout On Air discussion of Chapter 6, I thought that I would put “out there” my “conflicting” information, looking for some feedback. 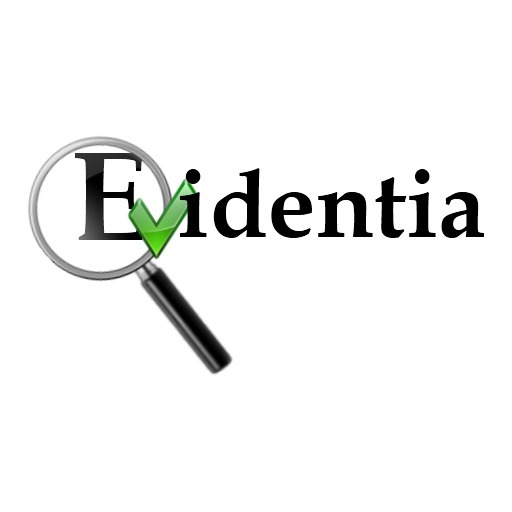 I have mentioned that I am using Evidentia for this project. I am trying to determine IF James A Wake served in the Civil War. From my research, so far, this James Wake appears to be a good candidate. However, I can’t determent if this James Wake is the Jame A Wake are the same person. That piece of conflicting information is not being addressed here. James A Wake, according to a Congressional Registration was 37 as of 1 July 1863, which would suggest that he was born about 1826. My research has found a James Wake as described below. This report is directly out of Evidentia from my data entry, to date. This James Wake was found with the same family members in the 1860 and 1870 census, and it appears in a household which may be that of his parents and siblings in the 1850 census. 14 July 2013 – Updated based on the 1870 Census – James Wake was 40 in this Census and would have him born between 26 Jun 1829 and 25 Jun 1830 in New York. The updated hypothisis for his birth range is now 2 August 1828 to 23 June 1831, in New York. 14 July 2013 – Looking at the 1850 Census, James Wake was 21 which would have his birth date between 02 Aug 1828 and 01 Aug 1829. This is earlier, by almost a year, from the 1860 census found initially, but still born in New York. 14 July 2013 – Based on the 1860 Census James Wake was born 24 Jun 1830 and 23 Jun 1831 in New York. 6 assertions from 3 sources were considered in evaluating this claim. The 1860 US Census – James Wake asserts that James Wake is 29 years old on 23 June 1860 which would mean born about 1831. The source reviewed was a clear unaltered Image Copy of an original record. It is indeterminable whether the information being considered is Primary (meaning we must assume the informant was not a knowledgeable eyewitness or participant in the event). The evidence supporting the claim is considered Indirect (meaning the evidence is implied, circumstantial or fails to answer the whole question). The 1860 US Census – James Wake asserts that James Wake was born in New York. The source reviewed was a clear unaltered Image Copy of an original record. It is indeterminable whether the information being considered is Primary, and must be treated as Secondary information. The evidence supporting the claim is considered Indirect. The 1850 US Census – James Wake asserts that James Wake is 21 years old on 01 August 1850 which would mean born about 1829. The source reviewed was a clear unaltered Image Copy of an original record. It is indeterminable whether the information being considered is Primary, and must be treated as Secondary information. The evidence supporting the claim is considered Indirect. The 1850 US Census – James Wake asserts that James Wake was born in New York. The source reviewed was a clear unaltered Image Copy of an original record. It is indeterminable whether the information being considered is Primary, and must be treated as Secondary information. The evidence supporting the claim is considered Indirect. The 1870 US Census – James Wake asserts that James Wake is 40 years old on 25 June 1870 which would mean born about 1830. The source reviewed was a clear unaltered Image Copy of an original record. It is indeterminable whether the information being considered is Primary, and must be treated as Secondary information. The evidence supporting the claim is considered Indirect. The 1870 US Census – James Wake asserts that James Wake was born in New York. The source reviewed was a clear unaltered Image Copy of an original record. It is indeterminable whether the information being considered is Primary, and must be treated as Secondary information. The evidence supporting the claim is considered Indirect. 21850 U.S. Census, New York Ward 8, New York, New York, Population Schedule, Page 203A, Line 11 – 16, dwelling 344, family 863, James Wake; digital image, Ancestry.com (http://www.ancestry.com : accessed 14 July 2014); citing NARA microfilm M432, roll 542, Image 10. 31870 U.S. Census, Hudson County, New Jersey, Bayonne, Population Schedule, Page 314A, Lines 30 – 35, dwelling 486, family 567, James Wake; digital mage, Ancestry.com (http://www.ancestry.com : accessed 14 July 2014); citing NARA microfilm M593, roll 863; Image 84, Family History Library Film: 552362. The question is two fold: 1) Do I have a conflict? and 2) Based on the evidence presented in the census records am I able to resolve the conflict. Please note that the To Do list is included in the report, under Recommendations for Continuing. What is your reaction to such a report? A few weeks ago, a friend of mine gave me a piece of paper, as she wanted me to look up her Civil War ancestor. She didn’t have a lot of detail, only this sheet of paper. I had not seen this type of record before, but my first place to look was to go to Fold3.com to see if there was a Civil War Record. I searched and browsed based on the information in these two pieces of information. Nothing was found. Since this image came from Ancestry.com, I wanted to locate it and “see for myself”. Found it quickly, but I wanted to know more about this collection. This is a collection of lists of Civil War Draft Registrations. There were four drafts between 1863 and 1865, which included 3.175 million records. Historically, the 1863 draft was one of the most tenuous moments in the Union outside of the battles fought on Northern soil. Most of the concern was due to the draft riots that took place in New York in 1863. The actual draft registration records are available in NARA regional archives and sometimes contain more information than the consolidated lists. In the case of James A Wake, he was listed in Schedule II of the Consolidated List, on page 201. Did James A Wake serve in the Civil War? Can I place him into a family? How is James A Wake related to the person who gave me this paper? I am going to use the software program, Evidentia to help build my case for these three questions. Here is what I suggested earlier, for my process. For this case study, I am going to start with what I know, based on the source listed above. I will create a Source Template for this image, as there wasn’t one provided, based on Evidence Explained, page 555 (Mills 2007). 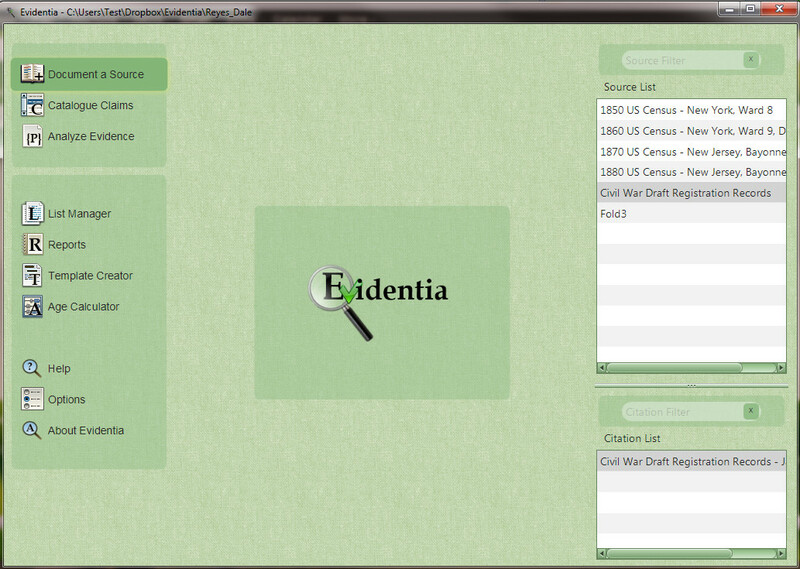 That is difficult to read, but here is what I looks like, with I generate a report in Evidentia. Below you will find the claims you have documented for the selected source. I then entered the information from this image, as Claims in Evidentia. This was entered as individual claims into Evidentia, which now looks like this. Now the Claims are linked to a Subject. The Claims based on the Source Report now looks like this. James A Wake appeared in the 6th Congressional District Registration record in New York. James A Wake reported his residence to be Christopher Street. James A Wake is 36 years as of 1 July 1863 and was born about 1827. James A Wake reported his occupation to be a Foreman at the time of registration 1863. James A Wake reported Place of Birth to be New York. James A Wake reported no former military service. James A Wake reported marriage status to be Married. So far, none of the questions can be answered. A negative source entry will be entered on the Name, James A Wake, as not being found in Fold3.com by Searching and Browsing. Since there is only one Source entered so far, AND we haven’t reviewed Chapter 5 of Mastering Genealogical Proof (Jones 2013). I will do some searching for US Census, as we know at this point, that James A Wake was born about 1827 in New York, and was still in New York in 1863 when he registered with the 6th Congressional District. At this point, I am only reporting and entered into Evidentia, this one Source information. Not enough information to evaluate, and am not even sure that it’s the right person. Basing the “right person” from the person who gave me the information.